Send the top 2 cards of your Deck to the GY, then target 1 card on the field that you can place a Spell Counter on; place up to 2 Spell Counters on it. 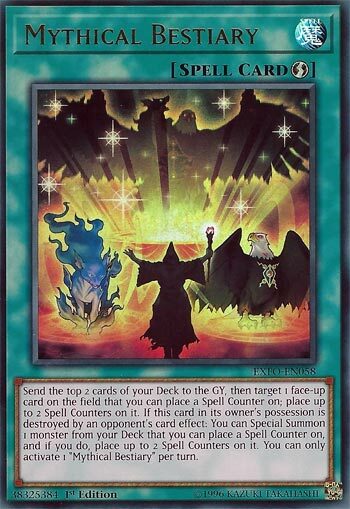 If this card in its owner’s possession is destroyed by an opponent’s card effect: You can Special Summon 1 monster from your Deck that you can place a Spell Counter on, and if you do, place up to 2 Spell Counters on it. You can only activate 1 “Mythical Bestiary” per turn. Mythical Bestiary might accidentally revive Library Exodia decks. This QuickPlay Spell Card has two effects that are in my opinion free. The first effect sends the top 2 cards from your deck to the grave to place up to 2 Spell Counters on a targeted face-up monster that can hold Spell Counters. Then, if it’s destroyed by an opponent’s card effect you can Special Summon a monster from the deck that can hold Spell Counters and put 2 on it instantly. Royal Magical Library, look it up and get some Exodia Pieces. Silent Magician support in 2018 is funny. Obviously this also works with the new Spell Counter Beasts. It is also great for any future cards that want Spell Counters. Own 3 in case some one breaks this card wide open. Spell Counter support in 2018 honestly is pretty cool, it is an interesting concept I am glad they revisited and here is a great Spell Counter themed card, Mythical Bestiary. Bestiary is a Quick-Play Spell that when activated, you send the top 2 cards from the deck to the GY to target a face-up monster you can place Spell Counters on and place either 1 or 2 counters. The only reason I can imagine someone choosing one counter is because of some limit a card has, otherwise you should pick 2. Being a Spell, most monsters will also gain more Spell Counters on top of what this already gave them. It is a minus at first, but you can easily repay that if you use this on the right card. Also, if this card is destroyed by an opponent’s card effect while in its owner’s possession, you can Special Summon a monster from the deck you can place a Spell Counter on and place up to two Spell Counters on it. Nice way to replenish resources and keep Spell Counters up on the field, only destroying this with an opponent’s card effect might not be too common anymore considering Cosmic Cyclone is the most popular S/T removal right now. You can only activate one of these per turn so you cannot generate too many Spell Counters for some reason, but you can always bank on your opponent using a Twin Twisters on two of these still, if that somehow pops up. Nice card for a cool theme. Art: 4.25/5 Honestly it is pretty majestic to see the Mythical Beasts like this. Silly Dark Paladin, trix are for kids! (I put a card here for today we all ready reviewed initially, and this ended up taking the spot the second time around). Mythical Bestiary is a Quickplay Magic, and one that can be quite good. Theme support cards usually aren’t so great, but this one can be awesome (for any Deck that is reliant on Magic counters) because it’s fast, and can add/cycle the counters for you. You send two cards from the top of your Deck to the Graveyard (no real trouble here, and it likely is only going to give you some options to Special Summon and/or recycle) and then you Target a Monster and add 1-2 Magic counters to it. Always go for the max, if possible. There’s going to be rogue situations you can’t, like maybe it only holds 2, and all ready has 1, or can only have 1. Also, if destroyed in the owner’s possession, you get to Special Summon a Monster from your Deck you can put a Magic Counter on, and add up 2 to Counters on it. So a 1-for-1 if destroyed, and that’s just as likely to happen, as we all know. It’s not an immediate benefit when played, but adding counters will help your theme, and make other things possible.